This bracket bolts to the passenger side steering knuckle in 5 places. It allows you to raise the drag-link above the leaf spring in a sprung-over YJ to minimize bump-steer. It also allows you to raise the drag-link to the top of the knuckle to gain about 3" of ground clearance. This part will also bolt to TJ Dana 30/Dana 44 knuckles for custom built steering applications. The axle brackets will have to be shaved to allow for clearance of the tie-rod when it is relocated above the knuckle. This bracket bolts through 2 of the 3 holes in the spindle. It also bolts through the top of the knuckle in 3 places. Two holes must be drilled to complete the installation. The existing tapered hole in the knuckle for the tie rod must be drilled to 5/8" to allow for a 3/4 x 5/8" heim joint. 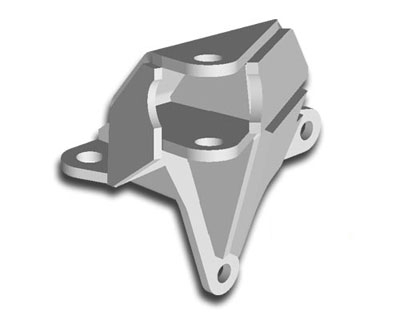 This bracket was designed in a 3D modeling software for great fit and is fabricated from 1/4" high-strength steel plate and is fully welded and gusseted for ultimate strength. *****This bracket will only work in JEEP applications with Dana 44/30 fronts. Non Coil spring JEEPS with a Dana 44/30 front will bolt up with minium modifacations. This bracket will not work with coil springs in stock locations. This bracket will only work on Dana 44/30 Jeep axles not any other brand. Click the button below to add the Cross-Over Steering Bracket for JEEP Dana 30/44 Knuckles to your wish list.